Some people explain depression as a dark cloud hanging over their head. It comes creeping when you least expect it. It grabs you by the neck in a blink of an eye and paralyses you. It pierces every cell of you body, leaving you numb and weak. All you feel like doing is lie down and surrender. Wait for it to pass, if it ever will. You fear that this time it won’t go away and you will be trapped in this claustrophobic box of darkness forever. It is floating inside your body with no intention of leaving you alone. The only thing that disappears is you. In this self-portrait I’m using a black veil to symbolize the dark clouds running around my mind. 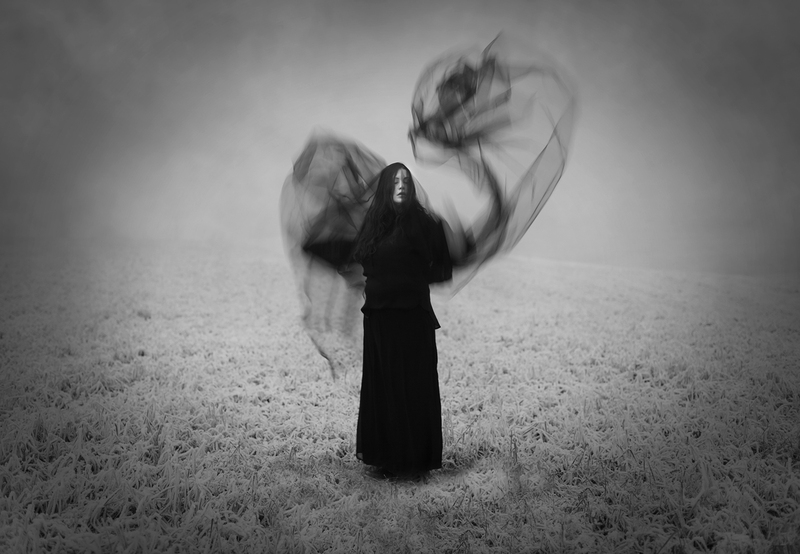 I decided to shoot the image on a foggy day in order to make the black veil pop against the background. Personally I feel that the contrast between the black and the white adds a nice touch of drama to the image. In order to make the veil resemble a cloud, I used long exposure while throwing the veil around my head. The challenge with long exposure is that everything that moves in the image gets blurry. It was quite hard throwing the veil around without moving my face at all and it took several attempts to get it right. In post production I converted the image to black and white and added quite a bit of contrast. In order to achieve a painterly look I added a texture layer and a vignette. Trying out different movements to make the veil to look like clouds. I want to finish this post with my favorite poem by Poe. In my darkest moments it always makes me feel better. The poem itself is sad but I can relate to it, and ironically, it makes me feel less alone. I urge everyone to read it.